Weather condition In Tiger Leaping Gorge ! 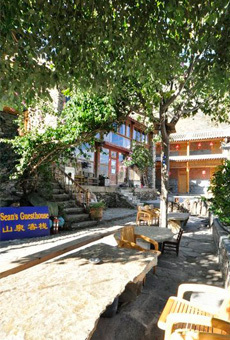 Sean's Guesthouse Welcomes you to Tiger Leaping Gorge! Tiger Leaping Gorge road and high trail no any problem for bus or hike, So you don't need worry or listen to any city peoples mouth or any old review writing, we are local peoples we living inside, we know more then any other peoples, you should trust us here! the Entrance fee is 65RMB per person, student hold card can get half discount price ! In fact this is a fantastic time to visit as there are not many visitors, especially Sean's place is very comfortable for family to enjoy the holiday in gorge, out of and away from the crowded tour group and city, Contact Sean's Guesthouse for the best choice of the family condition to book private tour in Gorge. if you book our En-suite room with touched bath room in our website, from 2016/02/28 until to the 2017/05/28, we will give you 20% of discount price follow on line booking show list! if you don't have paypal, you should be pay through by mail cash or wechat pay guaranteed before keep any type of room for you, warm welcome to Sean's Guesthouse! Yunnan province, the weather is very special compared to China or all over the world. In the winter cold season, it was most time sunny and dry to keep it warm . During the summer hot season, it was most time rains , keep he area good temperature. So if you are considering coming here during the winter, Tiger Leaping Gorge is a mild place, you don't have to worry about cold. If you are in Lijiang or Zhongdian, you may hear people telling you about bad weather conditions or other news - you should not believe them and try as hard as possible to do it by yourself instead! Check this area's weather by clicking this weather or underground but most of the time when they show it is raining, it is actually sunny in the gorge. if you want to know how is our Food ,Just link Food MENU . then you will see ! Chinese Proverb - "To know the road ahead, ask those coming back." Better still, ask someone who lives there! Local people are also part of the existence here and need transportation too! No matter the season and what the weather is, take your time, bring a rain coat and good outdoor boots and just go - don't just sit and plan it in your head! SPRING - February, March, April. The Chinese Spring Festival (春节) in February is a major holiday period from the first to the fifteenth of the first lunar month. With most of China visiting their families, transport and accommodation is heavily booked. Anybody intending to hike the gorge in this period is strongly advised to pre-book accommodation. By the end of February through May, temperature average is in between 20º to 30º degree. the walnut trees start to sprout their first young leaves of spring. Their soft lime green is challenged by the darker green of the winter wheat grown in terraces high above the Yangzi. The afternoon sun already hints at a hot summer ahead. By March other Colourful of nature help paint the scene with soft creams and pinks as the first fruit trees flower. SUMMER -May, June, July in the Gorge is perhaps the finest time for hiking Tiger Leaping Gorge with crisp air. In the winter, expect temperatures of 10º-26º degrees and during the summer around 30º-45º degrees. It is the perfect place for photographing the snowcapped mountains set against the bright blue afternoon skies. There is no snow or ice on the trails - only on the mountain tops. The Yangzi River runs clear and is a delightful greenish blue. The mornings and evenings will be chilly but the afternoons, usually are surprisingly warm. A good time to sit on a sunny rock and take in your surroundings. AUTUMN - August, September, October are the most fickle and unpredictable times of year for hiking Tiger Leaping Gorge as it is the rainy season temperature average is in between 24º to 36º degree . Check this area's weather by clicking this weather or underground but most of the time when they show it is raining, it is actually sunny in the gorge. Days of in tensed dry heat and the dazzling glare of cloud and drizzle are equally likely. After several days of rain, landslides may block the way, especially on the lower road. These landslides can range from the "very easy to across" to the totally impassable. The local authorities clear rock-falls fairly quickly and alternative tracks can be taken or a local guide used. But it is always advisable to check on the latest Gorge conditions before you travel. WINTER - November, December, January , temperature average is in between 10º to 20º degree . The winter is mostly dry Here in the Gorge, we don't get snow in the winter, but we can see the snow on the mountain peak are very pleasant times to hike Tiger Leaping Gorge - during this period season, the Gorge is full of the Colour as the corn is harvested from the fields. The treacherous summer rains ease, and the trails become firm and dry underfoot. Any more information what you need to know, just link left side of be lower Position Vacant menu list !! If you find this Website are helpful, please give Sean's some support !